Judy Moody is nuts for Nancy Drew, and she’s working hard to read all of the classic mysteries that feature her favorite girl detective. With all of this reading she’s been doing, Judy is just sure that she has what it takes to become the World’s Best Mystery Solver -- if only she could find a case that needs cracking. After solving the Case of the Bothersome Brother, the Mystery of the Missing Moose Mice, and the Secret of the Stolen Spectacles, she gets her big break when she finds a real, honest-to-jeepers, scare-your-pants-off mystery on her hands. When a local police dog in training, Mr. Chips, goes missing from his kennel, Judy jumps at the chance to test out her detective skills and save the day. As she follows the trail of clues surrounding the pup’s disappearance, she begins to suspect foul play and a nasty case of dognapping. Whodunit? And more importantly, WWNDD? (What would Nancy Drew do?) That’s what Agent Judy Drewdy and her associates, Agent Stinkbug, Agent Rock, and Agent Pearl, have to figure out before it’s too late! Readers will love cluing in to Judy Moody and her pals for sure and absolutely positive. Case closed. 170 pages. Recommended by Molly Crumbley, Librarian. 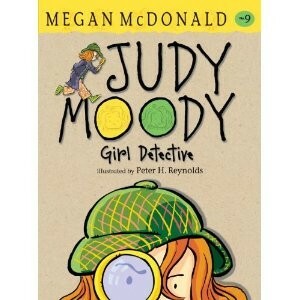 Being to have read every single existing Judy Moody book in the whole universe. This book is about Judy Moody who is trying to be like Agent Judy Drewdy (who is in love with Nancy Drew) with her assistants Agent StingBug, Agent Rock, and Agent Pearl. Read the book to find out if Agent Judy Drewdy is like Nancy Drew.